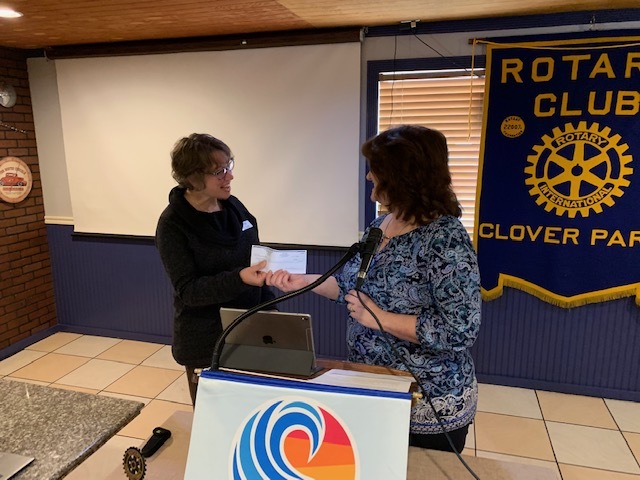 This was definitely "Disbursement Day" at Clover Park Rotary, thanks to Sheri Hodson and her Funds Request Review Team! 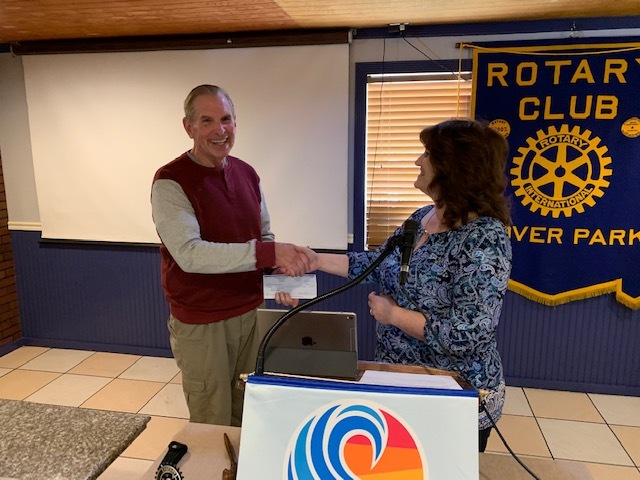 Emergency Food Network (EFN) received $500 to support their "Break Bag" program; CEO Michelle Douglas explained that EFN prepares student food packs to tide families over during school breaks. They distribute 2,000 Break Bags four times per school year. Several months ago, we heard from "Degrees of Change", an exceptionally successful college prep program. 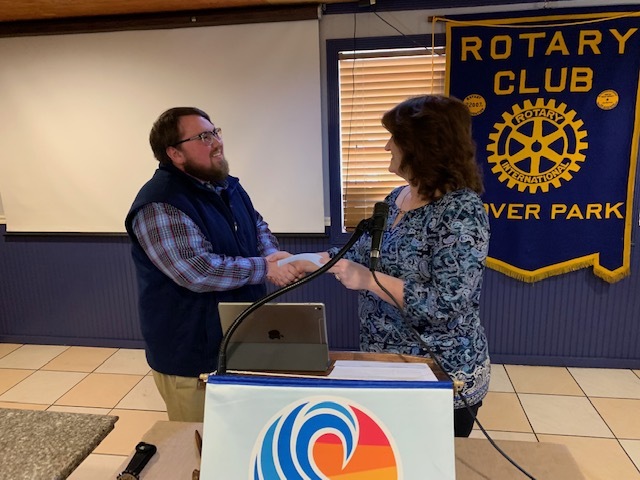 Program representative Tono Sablan accepted a donation of $250. Rumor has it that the inspiration for "McGruff The Crime-Fighting Dog" was none other than long-time Crime-Stoppers volunteer Bob Lawrence. He accepted a check for $500 to continue Crime Stoppers' great work! 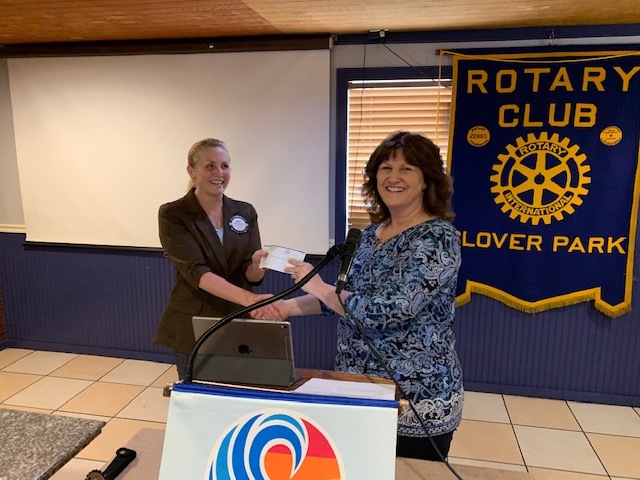 Lakewood's superb Community Development Director, our own Becky Newton, is a leader in coordinating the first Lakewood Youth Summit; Becky received a $500 donation to support this successful initiative. 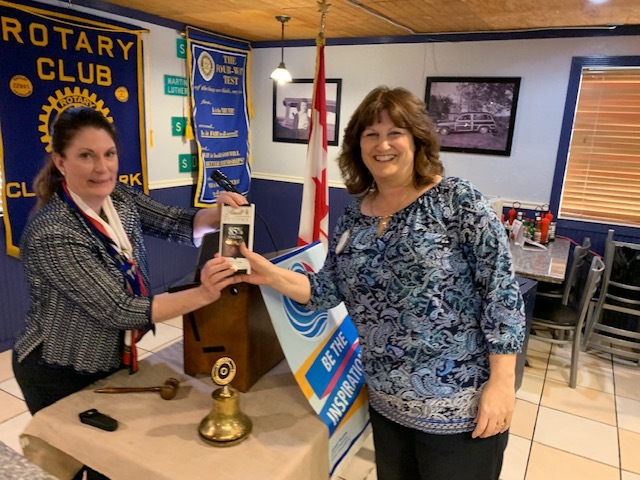 And speaking of awards, President Heidi recognized Sheri Hodson with a "President's Excellence" chocolate bar for going above and beyond the call of duty with facilitating funds requests! Next Week: Newly-elected Pierce County Prosecutor Mary Robnett will be providing an update on the Pierce County Criminal Justice System; this is sure to be an interesting and informative presentation, so please make plans to be present! SPECIAL NOTICE: BOLO (Be On the LookOut) for the official CPRI Sign Up form, coming to you in a separate "ClubRunner" email.  Remember, CPRI (Clover Park Rotary Invitational), a night of fun, frolic, and festive food, is happening on Friday evening, May 31, from 6:00 p.m. to 10:00 p.m., at Carr's Restaurant! We need to sell attendance and gather donations! Our program featured an engaging and committed leader of a veteran-led community service coalition, called "The Mission Continues" (TMC). Eric Ballentine, an Army veteran with deployments to Kosovo and Iraq under his belt, joined the organization in 2015, and was selected to lead the Tacoma 1st Platoon in 2017. 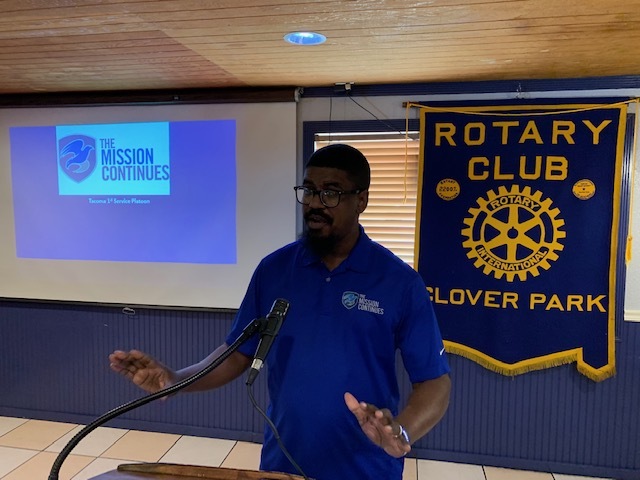 Eric explained that TMC partners with diverse organizations such as The Seattle Seahawks, East Tacoma Community/Friends of McKinley Park, UW-Tacoma and Seattle, and the Washington Department of Veterans Affairs, to name a few, working for the improvement of our communities. TMC's Core Values are: Trust, Respect, Work Hard, Have Fun, and Learn/Grow. 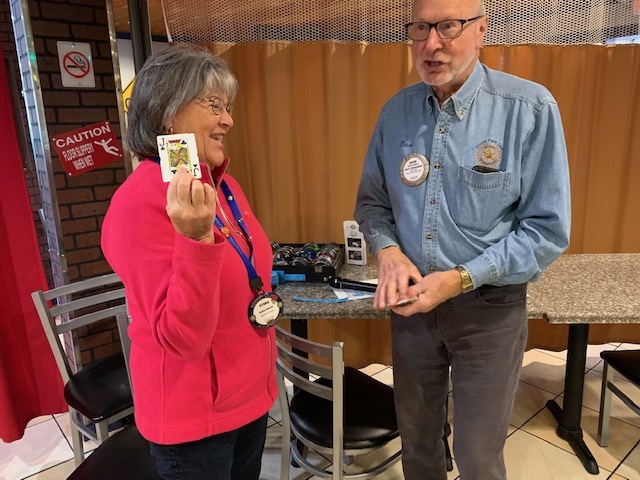 Our weekly raffle contestant was Sydna Koontz, who drew a Jack worth $5.